Andy and I got home from work Thursday night to find that WE HAVE CABINETS! We spent the rest of the night standing in the kitchen pretending to use the invisible stove and pretending to do invisible dishes at the invisible sink, and mostly saying, WE HAVE CABINETS over and over! You may think we’re kidding. 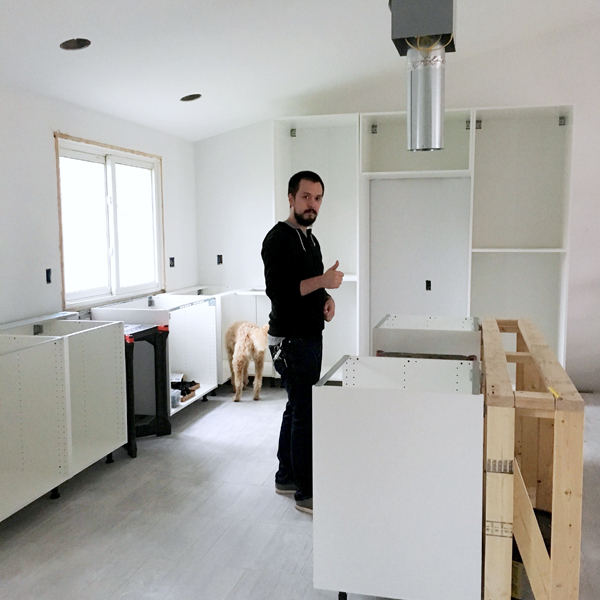 When he isn’t busy giving thumbs up, Andy has been putting together all the drawers. We decided to do all drawers instead of standard cabinets because we think drawers hold more stuff more efficiently. You don’t end up with old things at the back of the cabinet that you can’t see. Our vent hood is also now in, and we love it! It was one of those things that was so hard to picture ahead of time when we ordered it online, so it’s amazing to see it in person and know we made the right choice. 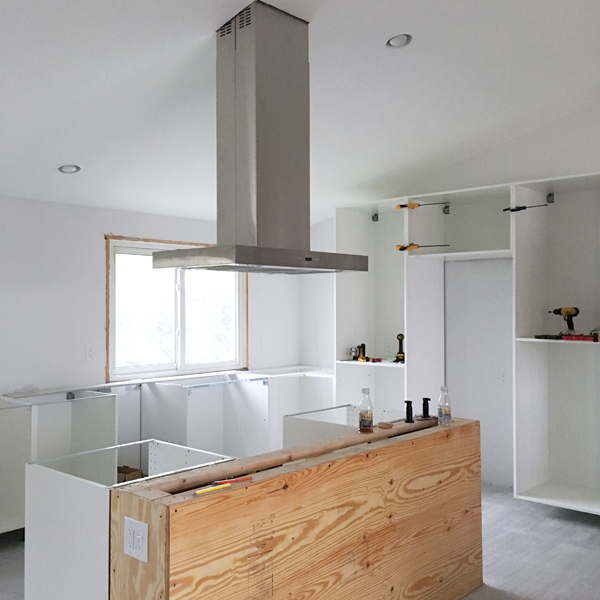 We love the modern look of this particular hood with its straight lines. 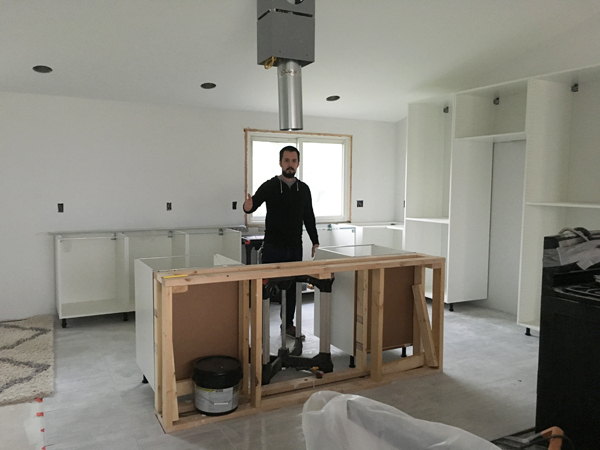 We also had been worried about how bulky it may look in the middle of the room since we decided on putting the stove in the island, but I think it actually helps the space feel less cavernous. They also wrapped the island in a layer of plywood. The plan is to paint it in semi-gloss white trim paint for now and then maybe wallpaper on the front side eventually, but to be honest, I kind of am loving the plywood. It’s not the right wood tone, but if it were stained do you think it could look pretty awesome? 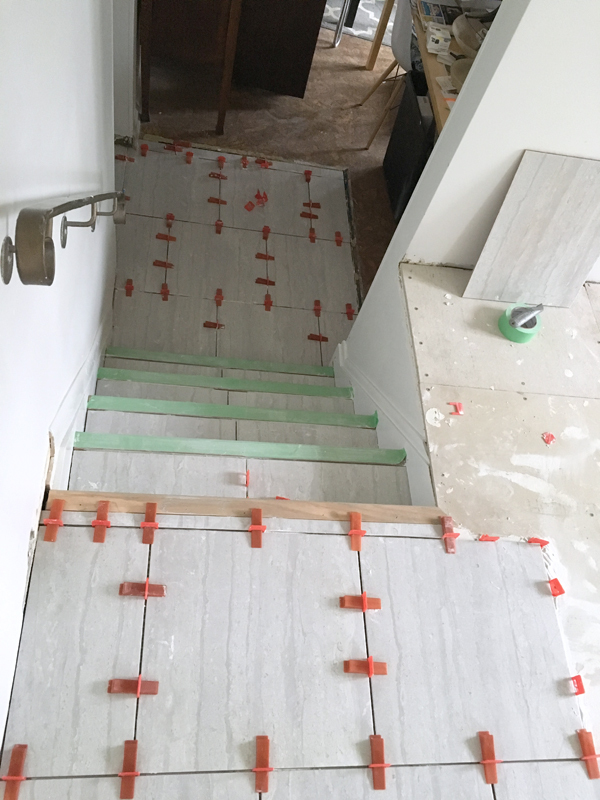 The final update this week is that they have started tiling the dining room part of the kitchen, down the stairs and the hallway that leads to the front door and half bath (to the left). It means we can’t get to our back door, which is at the bottom of these stairs to the right, and have to take Ruby out the front door and around to the back yard on a leash in order to take her out. Luckily it’s only for a couple of days, until they do the other half and we can’t get to the front door. Ugh. But we’re now SO CLOSE to done. 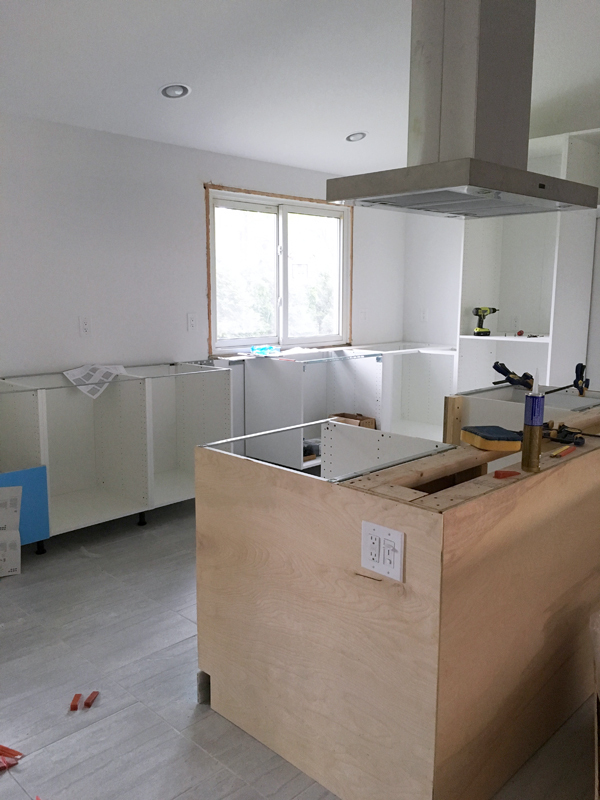 So what’s left… more drawers, more tiling, appliances, and waiting for countertops. So close!